At Baker Door Company, our team provides the highest quality work each and every time. The business is active since 1960, and we are still passionate about our work. Our experienced garage door technicians have one goal: to exceed customers’ expectations. To discuss your garage door project, give us a call today at 717-901-4056. Our personalized advice will help you to realize your project. With a population close to 15,000 people, Hershey, which is nicknamed The Sweetest Place on Earth, is the perfect place for just about any type of vacation you are looking for. During your stay, you will surely see Craftsman‑style houses, the most popular home‑style in this area. We recognize them by their low‑pitched gable roof with exposed rafters, decorative beams, or braces under the gables. Wood, stone, or stucco siding are also distinctive, as well as their open floor plan. If you have a house with this design, take a look at our image gallery to find the garage door that will add curb appeal to your home. Need a garage door repair in Hershey? We offer 24‑hour emergency service to ensure that you have help when you need it. When an emergency strikes or your garage door is not working, you can call us at 717-901-4056 or use our online contact form. Our technicians will schedule an appointment with you in a short period of time. We serve many cities around Hershey as Harrisburg, Enola, Camp Hill, Lebanon, and more. 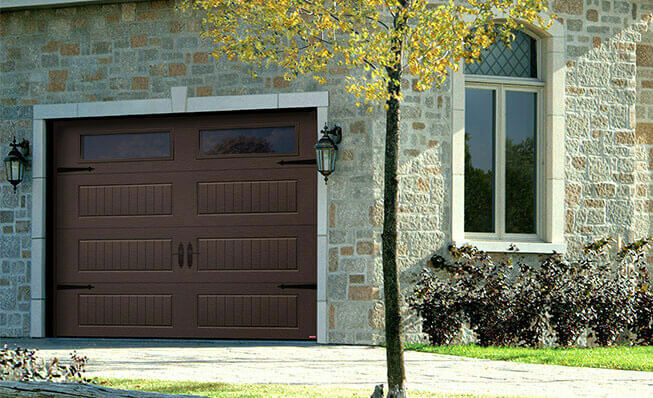 At Baker Door Company, we are specialized in garage door installation, service and maintenance. We can offer different garage door services in Hershey including garage door opener installation, the replacement of broken parts or springs, and even adding decorative accessories to give a new look to your garage door. We have in stock the majority of replacement parts; then we are always ready to solve your garage door issue. As winter is chilly, we highly recommend the Garaga Standard+ Collection with R‑16 insulation factor. The insulation of these garage doors will keep the cold outside during the winter, and will also keep your garage tempered during hot days in summer. The condition of your door makes an impact on your home's appearance and curb appeal. By upgrading your garage door, you do an investment that nearly pays itself. We recommend LiftMaster garage door openers to match your new garage door. Their systems are reliable and convenient, and the choice is diversified among residential and commercial products. Think about the ideal opener solution when you schedule with us your garage door installation in Hershey. Central Pennsylvania area including Lebanon, Harrisburg, Camp Hill, Elizabethtown, Shiremanstown and more.